Thank-you Booklook program for sending me this book for free in exchange for an honest review. I was not paid for this an all opinions expressed are 100% my own. Children will learn to trust God in everything as they learn about the names and character of God in the I Am Devotional. Through 100 devotions, children will see how God’s names reflect His love, strength, trustworthiness, etc., and what that means as they develop a strong faith. Application: Worship God by how you live! Diane Stortz has a proven history of connecting well with both children and parents in her writing. With sales of 500,000 inspirational books for children, Diane is a trusted name for Christian families. The art of Diane Le Feyer has captivated readers of I Am and will continue to delight in this accompanying devotional with vibrant illustrations throughout and a vivid cover embellished with foil and lots of striking glitter. 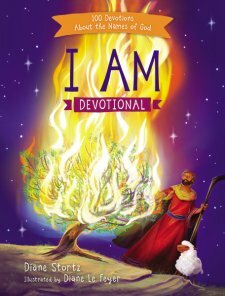 The I Am Devotional is the perfect companion to I Am, the Bible storybook that first introduced children to the names and character of God. This is a must have! I don't say that much at all so seriously considering giving this as a gift for any child in your life... or even adult. As I have been reading it aloud to my kids I have enjoyed it and gotten just as much out of it as my kids. We as Christians need to know God more so understanding him and all his qualities should be a priority of any Christian. As you continue to read this book you start to understand who God is but also how much he loves and adores each of us... his special creation. We were made on purpose for a purpose and with a purpose. How special is that?! As you learn more about God and his love you also start to trust him more. I think one huge factor for many of us is our lack of trust or faith... it prevents us from fully living to the potential of what God has planned in our life. If you want to love God better you need to know him better. Know him better by getting in his Word and also using this devotional to help too! I like how this devotional asks a couple thoughtful questions at the end and also makes you look up scripture to find an answer to one question. It is a great little feature that helps kids practice looking scripture up and develop the habit of being in the Word.